This document specifies WICD Mobile 1.0, a Compound Document profile based on XHTML, CSS and SVG, which is targeted at mobile agents. This is the 22 November 2006 Last Call Working Draft of the WICD Mobile 1.0, incorporating comments on the 19 December 2005 Last Call Working Draft. The disposition of Last Call comments is available. Changes are summarized in Appendix J, and a diff-marked version is also available to review changes since the last Working Draft. WICD Mobile is a perfect subset of WICD Full. It is therefor possible, to create content for WICD Mobile agents and make use of this content in a WICD Full implementation, for instance in a desktop environment. This specification contains information, which is specific to the WICD Mobile 1.0 profile. 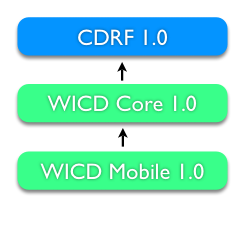 Any information that applies to all WICD profiles, is compiled into the WICD Core 1.0 specification. Any information that applies to Compound Documents in general, can be found in the Compound Document Framework (CDR/CDI) specifications. including the extended DOM API's and additional Events. <svg xmlns="http://www.w3.org/2000/svg" viewBox="0 0 60 60"
Conformant WICD Mobile 1.0 user agents must support the Focus Traversal features described in Appendix F Focus Traversal Support for all namespaces. In conformant WICD Mobile 1.0 user agents, the org.w3c.dom.AbstractView associated with an org.w3c.dom.DocumentView must be an implementation of the Window interface as defined in the Window Object 1.0 specification. In a static situation, focus should go back to where it came from, when a user navigates back. Conformant WICD Mobile 1.0 user agents, should allow activation of hierarchical child elements, using the "Ok" key. MIME implementations must in general treat unrecognized subtypes of "multipart" as being equivalent to Multipart/mixed. Agents supporting a WICD Profile are therefore expected to support both, related and mixed. Conformant WICD Mobile 1.0 user agents must support the updated version of CSS Mobile Profile 2.0. When declaring support for WICD Mobile 1.0, a conforming user agent should use an "Accept" header with the value: application/xhtml+xml; profile="http://www.w3.org/2005/12/wicd-mobile". Conformant WICD Mobile 1.0 user agents must support the Document Object Model (DOM) Level 2 HTML Specification subset defined in Appendix E Document Object Model (DOM) Level 2 HTML Subset for the nodes in the XHTML namespace. In conformant WICD Mobile 1.0. user agents, the root org.w3c.dom.Document instance must implement the FocusNavigation interface defined in Appendix F Focus Traversal Support for all namespaces. In addition to the Document interface attributes and methods defined in the SVG Tiny 1.2 uDOM specification, conformant WICD Mobile 1.0 user agents must support the adoptNode method on the Document interface, as defined in the DOM Core Level 3 specification. A DOMFocusOut event must be dispatched which has the previously focused object as the event target. After that, a DOMFocusIn event must be dispatched which has the new focused object as the event target. Whenever the method fails (i.e. a DOMException is raised), the focus must stay on the currently focused object and no DOMFocusOut or DOMFocusIn event is dispatched. The User Agent must always have a currently focused object. When the document is loaded, the root document has the focus. in EventTarget object. The object that should receive the focus. Note that this object may be in in the implementing document's tree or in one of the child documents. DOMException NOT_SUPPORTED_ERROR: Raised if the requested element is not focusable (i.e. its focusable attribute does not evaluate to true for an SVG element. For XHTML elements, if the element's local name is not one of 'select', 'input', 'textarea', 'a', 'object', 'button' or 'area'). Returns the current EventTarget which has focus. Initially, the focus is set on the root WICD root Document object. CSS Mobile Profile 2.0 Specification , Svante Schubert, Editor. Robin Berjon, Previous Editor. World Wide Web Consortium, to be published. Moved 4.2.1 "Keyboard Event Naming" to WICD Core (TM)". Moved 4.3 "Intended Layout" to WICD Core (TM)". Fixed typo "style sheet" in 4.3 "Intended Layout" (TM)". Updated URI under 3.2 ECMAScript 3rd Edition Compact Profile to point to the "Ecma-327 Compact Profile (ES-CP)". Updated URI under G References to point to "Ecma-327 Compact Profile (ES-CP)". Marked nine testable assertions according to Scott's list. Renamed section "1.1 Scope" to 2 Compound Document by Reference Framework Compliance and added: "User agents, conformant to the WICD Mobile 1.0 profile, must implement the complete CDR Framework 1.0, including the extended DOM API's and additional Events.". Updated references in G References and removed editial note regarding mime type reference. Combined all green issues under 3.3 CSS Mobile Profile 2.0 into the existing Editorial Note. Converted green text issue under 3.6 Document Object Model (DOM) into a new Editorial Note. Removed preliminary sections (containing only green text) "3.3 Document Size", "3.4 Child Object Formats" and "3.5 Child Object Layout". Changed all SHOULD to should / all MAY to may. Changed event names in from "up","down","left","right" and "activate" to "Up","Down","Left","Right" and "Ok". Removed 3.1.2 DOM Functionality (including ednote on preventDefault()/getBytesLoaded()). Added defitions to A Definitions. Added text to H Authoring Guidelines. Updated DOM section 3.6 Document Object Model (DOM). Added editorial note to reminding need for update Ecmascript mimetype reference 3.2.1 ECMAScript MIME Type. Out commented pointer to 'W3C Note on XHTML media types under 3.1.1 XHTML MIME Type. Removed note of OMA-WAP-ESMP-V1_0 in 3.2 ECMAScript 3rd Edition Compact Profile and 3.6 Document Object Model (DOM). Divided in three sections, marking two informative for the time being. Added a pointer to flat focus navigation under . Removed mentioning of uDOM 3.6 Document Object Model (DOM) informative. Renamed section "DOM [?]" to 3.6 Document Object Model (DOM). Renamed preliminary "Switching Off Adaptation Mode" to . New document structure, divided into and . 3.1.1 XHTML MIME Type to mandate "application/xhtml+xml".